Kisan Kranti Yatra LIVE Updates| Thousands of protesting farmers, who were stopped from entering Delhi on Tuesday morning, rejected home minister Rajnath Singh's assurances that most of their demands will be met and said the stir won't stop. They said they will stay put at the Delhi-UP border all night and would again resume their march on Wednesday morning. The farmers said they were not satisfied with the government promise that a committee of chief ministers will be formed to look into their demands. As a preventive measure, the district magistrate of Ghaziabad has ordered all schools and colleges in the city to remain shut on Wednesday. Home Minister Rajnath Singh held discussions with Union Agriculture Minister Radha Mohan Singh and a few others to discuss the farmers' issue, after which Union Minister of State for Agriculture Gajendra Singh Shekhawat met the protesters to assure them that their demands will be looked into. He was booed off the stage by the farmers. Naresh Tikait, the chief of Bharatiya Kisan Union (BKU), which has given the protest call, said the farmers are "not satisfied" with the government's assurance. "We will discuss this and then decide on future course of action. I can't decide anything alone, our committee will take the decision," he added. Commuters between Delhi and Uttar Pradesh faced a tough time as some roads were blocked for traffic due to the farmers' march. Traffic congestion was reported on the DND (Delhi Noida Direct) flyover, Apsara border, GT Road, Vikas Marg which are used by motorists for commuting between Delhi, Noida and Ghaziabad, police said. The police, however, said the situation was under control since it was a holiday on the occasion of Gandhi Jayanti. The Delhi Traffic Police had also issued an advisory, asking motorists to avoid the Meerut Expressway. The traffic police has also issued an advisory for Wednesday in view of the large gathering of farmers on the Meerut Expressway. Commuters have been advised to take the Noida Link Road to reach Sarai Kale Khan, Ashram and Barapulla flyover via Nizamuddin flyover. They have been advised to take Vikas Marg to reach ITO. To reach Darya Ganj, Chandni Chowk, Kashmere Gate and Tis Hazari, commuters have been advised to take Geeta Colony flyover, the police said. With the farmers' protest at the Delhi-UP border continuing, the district magistrate of Ghaziabad has announced that all schools and colleges will remain closed tomorrow (Wednesday) as a preventive measure. Leaders of the farmers' protest have said that they have decided to stay the night at the Delhi-UP border on Tuesday, although, Wednesday's protest strategy is yet to be decided. In all probability, agitation is to be continued on Wednesday and the decision to march towards Kisanghat will be taken by Tuesday night. "The BJP government had decided that a package will be prepared for clearing loan dues but it is still pending ... petrol, diesel prices are constantly being increased , demonetisation and GST have also hit farmers just like traders," Akhilesh said. The former chief minister said the government had promised farm loan waiver but several farmers are yet to benefit. "It was said that loans of all the farmers will be waived but it is still pending for several farmers ... The new cane crop is getting ready, sugar mills have to start crushing but the payment of the past is pending and so the farmers have come out on the roads," he said. As thousands of farmers tried to enter the national capital in a massive protest march, the government Tuesday announced that a committee of chief ministers will look into their demands, even as the protesters stayed put saying they were not "satisfied" with the assurance. Farmers marching towards Delhi under BKU's protest call were stopped at the Delhi-Uttar Pradesh border, as they tried to run through the border, surmounting the barricades. Akhilesh Yadav Extends Support to Protesting Farmers | Samajwadi Party president Akhilesh Yadav Tuesday extended his party's support to the farmers protesting under the aegis of Bharatiya Kisan Union (BKU) in support of various demands ranging from farm loan waiver to cut in fuel prices. 'The farmers have come out in support of their various demands... If we look at things, in the past over four years, almost 50,000 farmers have committed suicide, mostly in BJP-ruled states, including Uttar Pradesh," Akhilesh said. "The BJP government had decided that a package will be prepared for clearing loan dues but it is still pending ... petrol, diesel prices are constantly being increased , demonetisation and GST have also hit farmers just like traders," he added. "The plan to stay the night here and march towards Kisanghat tomorrow again is what has been told to everybody. However, this is not the final plan, but has been temporarily devised to satisfy farmers at the moment who were angry at the rally not reaching completion," told Tikait. Farmers to March Towards Kisanghat Tomorrow | National president of Bahujan Kisan Dal, Rakesh Tikait told reporters that some farmers will proceed to Kisanghat tomorrow and the rest will stay back. The protest will continue. "We want to meet Rajnath Singh. We want him to come here and talk to our people. Farmers will stay the night and attempt walking to Kisanghat again tomorrow," Tikait said. 'Shekhawat Made Fake Promises and Left' | Sugarcane farmers have alleged that the last payment received by the Govt was on 6 January, 2018 and since no payment has reached them. "We were forced to take loans because of no money. Now banks want the money back and we are yet to get payments. How do we pay? Where will the money come from? This dual problem was unaddressed by the Centre. Shekhawat just made fake promises and left. Are we expected to be satisfied with this? Also, apart from loan waiver the minister did not even mention anything about electricity bills. We will continue to protest," they said. Farmers Not Willing to Go Back | Largely dissatisfied with the government's new announcements to woo them, majority of the agitating farmers are not willing to retreat. 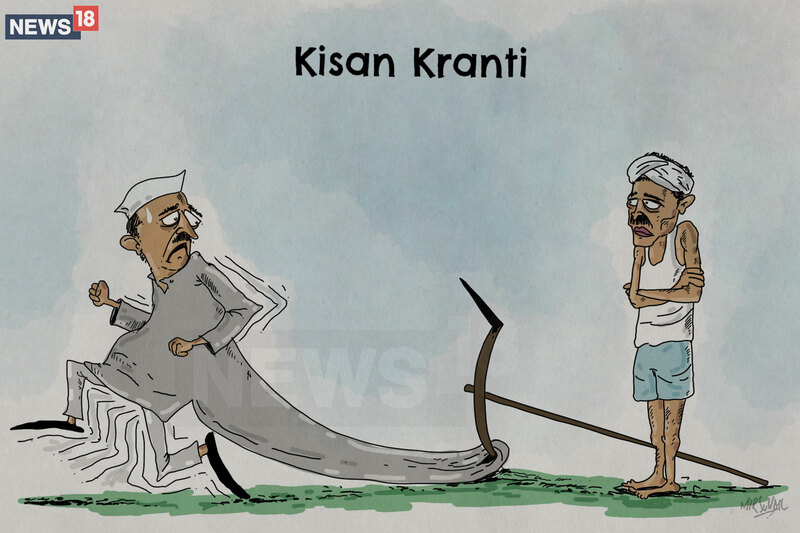 Farmers want to still continue marching towards Kisanghat in New Delhi. Now, the leaders are yet to take a call on their next move ahead. Protesting Farmers Not Impressed with Govt's Promises | Shekhawat further also said that GST on products needed for agriculture, like sprinklers, has been reduced to 5 percent from 12 percent earlier. The minister also announced that Kisan Credit cards will be regularised with a ceiling on interest rates within 3 months. “MSP on Rabi crops will be implemented within three days, while rates on Kharif is yet to be decided. Dal and wheat will not be imported anymore. Rajnath Singh to meet all Kisan netas within one week. Special committee will also be there,” he said. But the announcements and promises failed to impress voters, who kept shouting “Nai (no)” during his speech and started waving after he stopped. They then booed him as he left the stage. 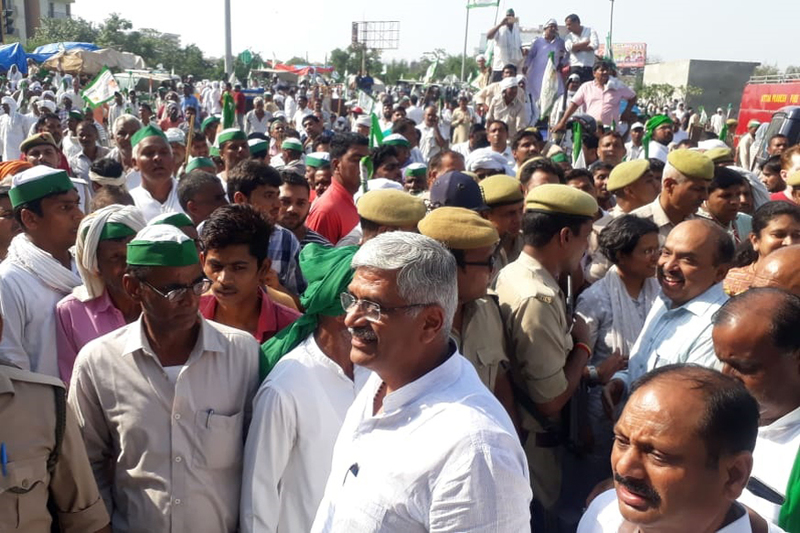 Agitating Farmers Boo Agriculture Minister | Union minister of state for Agriculture, Gajendra Singh Shekhawat, was booed off the stage by the protesting farmers at the Delhi-UP border after he listed the steps the Centre has taken to alleviate their woes. Shekhawat said that the government is mindful of the concerns raised by farmers and will challenge the NGT decision to take diesel vehicles off roads after 10 years as it also includes tractors used in fields. 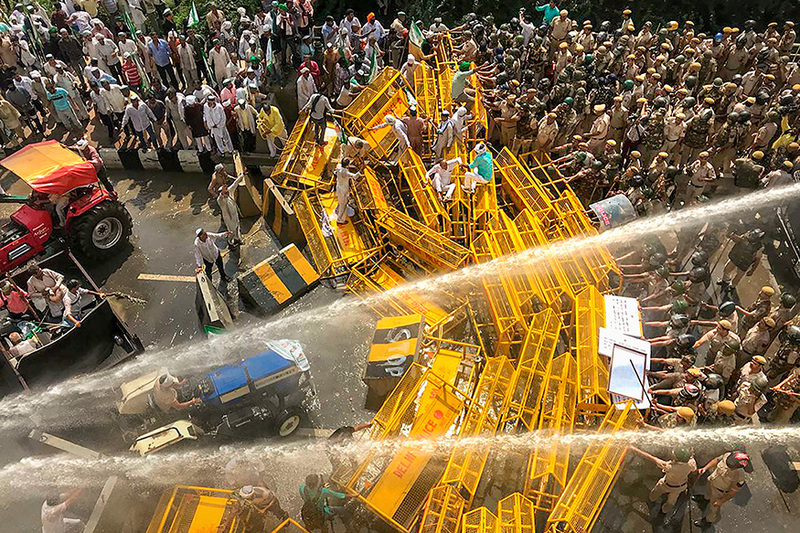 Quick Recap | Thousands of farmers on Tuesday marched towards Delhi over demands ranging from farm loan waiver to cut in fuel prices, blocking traffic movement on arterial roads leading to the national capital. National Highways leading to the national capital were swamped with farmers who came in from places as far as Gonda, Basti and Gorakhpur in eastern Uttar Pradesh as well as the sugarcane belt of western Uttar Pradesh.The Kisan Kranti Yatra, which began from Tikait Ghat in Haridwar on September 23, was joined by farmers from various parts of Uttar Pradesh. Farmers came on foot, in buses and tractor trolleys carrying banners of Bhartiya Kisan Union, which gave the call for the march to press for a series of demands. Uttar Pradesh Cane Development Minister Suresh Rana says that Centre will challenge NGT decision in Supreme Court. The National Green Tribunal’s (NGT) had ordered a ban on private and commercial diesel vehicles older than ten years, which has hit farmers’ interests. The ban on agricultural machines and vehicles that consume diesel effectively means that the majority of the burden will be borne by the farming community. The BKU has also called on the government to either set up a flagship fund to provide the farmers with monetary compensation to buy new tractors or scrap the NGT order. The issues of immediate consideration of the government include lifting the National Green Tribunal's order to ban 10-year-old tractors, uniform and complete procurement of crops, uniformity in loan waiver in the country, equal electricity tariff in the country, farmers' friendly insurance scheme and equal pension to both farmers and agricultural labourers. Those who attended the meeting include Union minister of state for agriculture Gajendra Singh Shekhawat,Uttar Pradesh sugarcane minister Suresh Rana, Union home secretary Rajiv Gauba, Director of the Intelligence Bureau Rajiv Jain and Delhi Police Commissioner Amulya Patnaik. Home Minister Rajnath held discussions with Union Agriculture Minister Radha Mohan Singh and a few others on how to resolve the farmers' issues and pacify them. The development comes after farmers marching towards Delhi as part of the Bharatiya Kisan Union's (BKU) protest call over demands ranging from farm loan waiver to cut in fuel prices, were stopped at the Delhi-Uttar Pradesh border Tuesday with police using water cannons to disperse them. The home minister also spoke to chief of BKU Rakesh Tikait over phone and conveyed the government's keenness to address their demands. As Uttar Pradesh Cane Development Minister Suresh Rana arrived at Delhi-UP border to meet the farmers along with Union agricultural minister Gajendra Singh Shekhawat, farmers raised slogans 'Suresh Rana wapas jao' (Suresh Rana go back). Shekhawat and Rana were accompanied by agriculture secretary and a PMO director. "Peaceful and unarmed farmers going towards Raj Ghat were brutally treated, they were lathi charged and teargas shells fired on them.We condemn this," says JDU leader KC Tyagi. Union Minister of State for Agriculture Gajendra Singh Shekhawat meet protesting farmers at Delhi-UP border during Kisan Kranti Padyatra. Farmers from 15 States Present at Kisan Kranti Padyatra | Kisan delegation from Uttar Pradesh, Tamil Nadu, Punjab and Karnataka amongst others who are present at Kisan Kranti Padyatra. Close to 15 representatives from various states are participating. 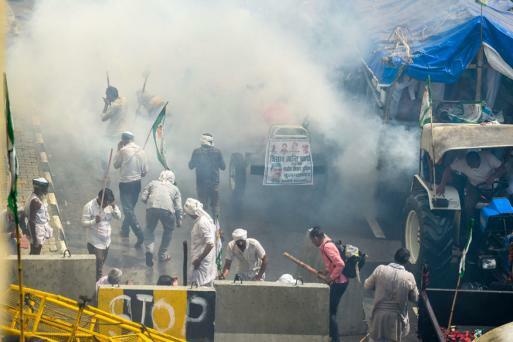 Chaos had prevailed earlier in the day as the had taken a violent turn with police resorting to firing water cannons and tear-gas shells to keep the angry farmers from crossing into Delhi. Several farmers have been injured while the Haryana unit chief of the BKU is unconscious after a tear gas shell exploded close to his face. Seven policemen, including an assistant commissioner of police, were injured on Tuesday during the protest by farmers on Delhi-UP border, Delhi Police said here. Some of the protesting farmers claimed that a few Delhi Police personnel had resorted to lathicharge against some of them. The Delhi Police, however, denied the charge. A posse of security personnel have been deployed, including from Delhi Police and the paramilitary forces. "Nearly 2,500 personnel from Delhi Police, besides paramilitary forces, including the Rapid Action Force (RAF), have been deployed," a senior police officer said. Farmers marching towards Delhi under BKU's protest call over demands ranging from farm loan waiver to cut in fuel prices, were stopped at the Delhi-Uttar Pradesh border, as they tried to run through the border, surmounting the barricades. The farmers, riding tractors and trolleys, broke barricades of the UP Police and then started proceeding towards the barricades put up by the Delhi Police, a senior police officer earlier said. Police had to use water cannons to disperse the protestors, who also indulged in sloganeering. Tear gas was also used to disperse the crowd. The main demands of the farmers include implementation of the recommendations of the Swaminathan Commission report, removing ban on the usage of tractors above 10 years, clearing out pending payments of sugarcane purchase, increased price of sugar supplied and minimum support prices. Amar Pal, 35, a farmer from Muzaffarnagar alleged that some police personnel "resorted to lathicharge" on some of the protesting farmers. The incident has darwn sharp reactions from Congress while AAP supremo Arvind Kejriwal batted for the farmers and questioned why they were not allowed to enter Delhi. Congress president Rahul Gandhi in Wardha accused the BJP of "brutally beating up" farmers at the Delhi border on International Day of Non-Violence and said they cannot even air their grievances in the national capital. The Kisan Kranti Yatra, which began from Tikait Ghat in Haridwar on September 23, was joined by farmers from various parts of Uttar Pradesh. "We are not seeking any alms from the government. We want our right," said Harmik Singh, a farmer who came from Meerut. Farmers are in distress because of high electricity prices and fuel rates shooting through the roof, "Aap ko 500 rupiya ka gas theek lagta hai? (Does LPG price of Rs 500 sound right to you," a faremr asked. Kejriwal said preventing a protest march of farmers from entering the national capital was "wrong" and pitched for their entry into the city. "Why are the farmers being stopped from entering Delhi? It is wrong. Delhi belongs to all. They should be given entry in Delhi. We support their demands," he told reporters on the sidelines of an event held at the Delhi assembly to mark Gandhi Jayanti.